We’d love your help. Let us know what’s wrong with this preview of The Emotional Life of Your Brain by Richard J. Davidson. This longawaited book by a pioneer in brain research offers a new model of our emotions- their origins, their power, and their malleability. For more than thirty years, Richard Davidson has been at the forefront of brain research. Now he gives us an entirely new model for understanding our emotions, as well as practical strategies we can use to change them. Davidson has dis This longawaited book by a pioneer in brain research offers a new model of our emotions- their origins, their power, and their malleability. For more than thirty years, Richard Davidson has been at the forefront of brain research. Now he gives us an entirely new model for understanding our emotions, as well as practical strategies we can use to change them. To ask other readers questions about The Emotional Life of Your Brain, please sign up. CAN I READ IT OFFLINE? Rhea can i read it now? This is not "light" reading, but still truly fascinating. If you don't mind reading about the clinical and scientific aspects of how the brain functions and why we do what we do, this is a worthwhile read. -Self-Awareness This is not "light" reading, but still truly fascinating. If you don't mind reading about the clinical and scientific aspects of how the brain functions and why we do what we do, this is a worthwhile read. I think all of us are aware we need change or improvements in one or more of these areas. So what was interesting were his suggestions (with scientific experiments to back him up) as to how to go about doing just that. Many people think "I just am the way I am. I can't help how I think-- how I feel-- how I react." Trust me ... been there. But I've also done my fair share of re-evaluating instances or events from my past to know that realigning one's thoughts (and, in turn, one's emotions) IS possible. Reading this only reaffirmed that and has made me more conscious of my ability to continue to do so. I bought this book because I find anything about neuroscience pretty interesting, and the emotional aspect doesn't seem to have been investigated in any rigorous way until recently. This book promises to satisfy that, and, to a large extent, I think it does. I found myself constantly struggling with a sort of duality in this book. At some points I found the observations to be extremely obvious, such as the idea that our emotional styles aren't simply genetic, but a product of our environment and I bought this book because I find anything about neuroscience pretty interesting, and the emotional aspect doesn't seem to have been investigated in any rigorous way until recently. This book promises to satisfy that, and, to a large extent, I think it does. I found myself constantly struggling with a sort of duality in this book. At some points I found the observations to be extremely obvious, such as the idea that our emotional styles aren't simply genetic, but a product of our environment and upbringing. Well... yeah. And it took several clinical trials to work that one out? But then he reveals the subtle side of those observations - about how our upbringing doesn't just change our thought patterns, it actually changes the physical configuration of our brains, and he goes on to explain in finer detail, with examples, what this involves. There's plenty of interesting tid-bits about which bits of the brain usually do what (I say usually because he shows how that can change too), and provides insight into how we can modify our emotional styles so that we can be better balanced individuals. I don't generally go for self-help books, but I couldn't help catch the bug on this occasion. There seems to be genuine research to back up his claims, and it definitely gave me pause. This book is a snoooozefest. Unfortunately I had to read it for school, and thank god it’s over. I'm not much for self help mind over matter books, but this one seems to have a lot of research to back up what it says. I am bothered by the author's self congratulatory style. I first heard of Dr. Richard Davidson’s work in the field of neuroscience a couple of months ago in an unlikely setting: the annual conference of the National Art Education Association in New York. Regular readers might remember my mention of the Compassion Project in Appleton, Wisconsin, which challenged teachers and students at all levels to give some thought to the nature of compassion, to some discussion, and then to join in a collaborative art project. The results, an amazing 10,000 tiny pa I first heard of Dr. Richard Davidson’s work in the field of neuroscience a couple of months ago in an unlikely setting: the annual conference of the National Art Education Association in New York. Regular readers might remember my mention of the Compassion Project in Appleton, Wisconsin, which challenged teachers and students at all levels to give some thought to the nature of compassion, to some discussion, and then to join in a collaborative art project. The results, an amazing 10,000 tiny paintings, all about four inches square, were installed in an exhibition at the Trout Museum. As a result of Dr. Davidson’s idea, an entire community became involved in a project intended to increase the understanding and practice of compassion among human beings. Brilliant, I thought. Now this same Richard Davidson’s book falls into my hands. Co-written with science writer and editor Sharon Begley, it’s called The Emotional Life of Your Brain, and the first two-thirds of it are science. To be honest, my eyes tend to glaze as I attempt to grasp the meaning of it all; my own brain was not trained to follow the meticulous detail of scientific method. Still, I was more than willing to make the effort, because I have come to believe so passionately in the argument that Davidson presents: that we can literally “change our minds.” In the course of life, from childhood on, we acquire certain attitudes, certain ways of thinking about ourselves and the world, certain mental and emotional patterns that can—but need not—entrap us and impoverish our lives. Davidson skillfully and persuasively applies the principles and super-advanced technological tools of scientific research to demonstrate these truths. It is the last third of the book that is the easiest for me—from the moment he brings in the monks (with the enthusiastic help of none other than the Dalai Lama) to test them for the effects on the brain of long-term meditation. I have argued often in the pages of The Buddha Diaries that meditation offers us the power to discipline the mind to do those things we want it to do, rather than follow its natural tendency to wander off and play, or engage in fruitless and distracting tasks that do nothing but support our old, often destructive habits. It is fascinating and immensely satisfying to see these ideas put to the scientific test and proven to be sound. Davidson’s research demonstrates that meditation can affect not only the minds of long-term meditators like those Tibetan monks who spend long, solitary years in remote mountain caves; even short-term practice, he shows, can produce dramatic results in the rawest of novices. The last chapter of the book offers practical, how-to steps that can lead to greater strength of mind—and, indeed, to a more purposeful and satisfying life. With a consistent practice of the visualization and meditation techniques that he describes in detail, we can change the way our brains function and create “new channels in the stream bed of the mind.” We can even change our personalities in significant, life-altering ways. For skeptics, as I myself remained for many years, Davidson’s book presents a convincing scientific argument for the kind of Mind Work that I approach in a very different way (ahem, forgive me: I am not a "book critic"!) in my own recent book of that title. This book is absolutely fascinating. Author Davidson is the founder of the Center for Investigating Healthy Minds at UW-Madison. He's gotten a lot of attention with his work doing brain scans on Tibetan monks while they meditate. This book is an introduction to the work he's been doing. He has come up with six different categorizations of types of mental/emotional styles that operate something like the Myers-Briggs type indicator. Each category places you on a spectrum between two extremes, whic This book is absolutely fascinating. Author Davidson is the founder of the Center for Investigating Healthy Minds at UW-Madison. He's gotten a lot of attention with his work doing brain scans on Tibetan monks while they meditate. This book is an introduction to the work he's been doing. He has come up with six different categorizations of types of mental/emotional styles that operate something like the Myers-Briggs type indicator. Each category places you on a spectrum between two extremes, which leads to an infinite variety of styles. Unlike Myers-Briggs, Davidson's styles are based on actual neuroscience studies. Davidson gives a great history of his work in the book, lays out the details of the emotional types and how they work, then provides a brief introduction into how people can work to modify their emotional styles. If I have one complaint with the book, it's that the section on "how-to" could have been longer. I hope at some point in the future he will maybe devote an entire book to the practical applications of how the styles work, and how we can modify the workings of our own mind. I especially love this book, and Davidson's work, for it's tight integration with Buddhism. The Dalai Lama has been a strong supporter of Davidson's research, which I think is very cool. When Davidson's new Center opened at UW-Madison, I was able to go to Madison to see a discussion between Davidson and the Dalai Lama facilitated by Daniel Goleman. It was unbelievably cool to listen to the Dalai Lama discuss the importance of scientific research for bettering our understanding of humanity (while wearing a Badgers baseball cap no less!). We are so fortunate to have Richard Davidson here at the University of Wisconsin, so those of us that know him can testify that his findings that regular meditation can change your brain patterns and make you calm and cheerful despite a busy life hold particularly true in his example. The other benefits of mindfulness training, as well as other approaches to altering our brain's responses to stimulus, are fascinating -- and are clearly described in this book, which also describes recent discover We are so fortunate to have Richard Davidson here at the University of Wisconsin, so those of us that know him can testify that his findings that regular meditation can change your brain patterns and make you calm and cheerful despite a busy life hold particularly true in his example. The other benefits of mindfulness training, as well as other approaches to altering our brain's responses to stimulus, are fascinating -- and are clearly described in this book, which also describes recent discoveries regarding the parts of the brain used for different aspects of emotion and perception. The fact that the brain is more elastic and forgiving than had originally been thought holds hope for those who are suffering. MY God this book was so amazingly interesting! It provided such insight into the way the mind works and how the patterns in our brain help shape us into the people we are. This took me quite a while to read because it is a heavy book; it requires a lot of focus (at least for me it did) and I found I had to really sit and think about what I was reading. It was like a step down from reading a textbook. There were plenty of facts and spatterings of humour. It was good for me to read as I am studyin MY God this book was so amazingly interesting! It provided such insight into the way the mind works and how the patterns in our brain help shape us into the people we are. This took me quite a while to read because it is a heavy book; it requires a lot of focus (at least for me it did) and I found I had to really sit and think about what I was reading. It was like a step down from reading a textbook. There were plenty of facts and spatterings of humour. Those of us committed to personal growth will find much that is rewarding in The Emotional Life of Your Brain. Davidson draws on an array of scientific experiments and studies to develop a set of ideas that can add to our understanding of how the “emotional brain” works, how its unique patterns affect the way we think, feel, and live, and how we can change them. These ideas have broad implications. They suggest that we are not irremediably shaped by our genes, upbringing, environment, or of this or that neural circuitry in our limbic system. We are not at the mercy of our emotions. We can change because our brain can change. The question of course is how. Davidson answers this question in the terms of traditional psychology by focusing on personality and temperament, offering a new classification of these traits which he calls “Emotional Style.” His claim is that “Understanding the neural underpinnings of the six dimensions of Emotional Style can empower you to recognize your own” overall style and apply various techniques he recommends to change it in the direction you desire. Briefly stated, the six dimensions are: Resilience (how fast you recover from adversity); Outlook (optimist vs. pessimist); Social Intuition (how adept you are at picking up social signals); Self-Awareness (how well you are in touch with your feelings); Sensitivity to Context (how well you adapt your emotional responses to a given context); and Attention (how well you can focus). Now, suppose I answer the book’s questionnaires for these categories, identify their neural correlates in the brain, conclude my styles are “Slow to Recover” and “Self-Opaque,” and follow Davidson’s techniques in the back of the book so that, assuming they work, I’m able to recover faster after my morning argument with my coworker. Does that improve my relationship with my coworker? Not necessarily. In fact, it could even worsen it, for the more successfully I reduce their negative impact on me and the faster I recover from these arguments the easier it is to continue having them. They just won’t bother me that much anymore. But they may bother my co-worker, other colleagues, and my boss. My “resilience” could actually end up making a lot of people unhappy, affect my work, and even cost me my job. This is because traits of personality and temperament do not necessarily correlate with the rightness or wrongness of what I’m doing. They are not moral categories. A high degree of optimism can lead me to take unreasonable risks in business or the stock market and leave me in financial ruin. High social intuition, self-awareness, and sensitivity to context can all help me manage myself better the better to lie and manipulate people. Being highly focused can help me succeed in my career even as it leads me to neglect my family and fail as a spouse and as a parent. In the situation cited by Davidson, I need to look at more than my “emotional style.” I need to look at what I might be doing wrong, at the moral dimensions of the situation. This means looking at my character, understood as a moral category. Traits of character determine whether a trait of personality or temperament serves a morally worthy or unworthy end, whether it works for good or for ill. But Davidson’s model, which is based on personality and temperament to the exclusion of character, makes no provision for such considerations. A more effective model for personal growth is found in the 12 Steps of Alcoholics Anonymous, whose principles, it should be noted, can be practiced by anyone. One of these principles is the discipline of self-examination, where I make an inventory of my character defects and associated emotions, taking into account the positive character traits and associated emotions which can displace and replace them. Considered principles of the good life, these positive character traits are traditionally known as virtues, among which, honesty, for instance, is essential to the process of self-examination. Honestly looking at myself in the above situation, I might find that my “funk” is the result of my nursing a resentment against my coworker. I may be “irritable” because I’m still angry over something she said or did that affected something that is important to me (e.g. my self-esteem), and I’ve been obsessing about it all day. Upon further examination, I may discover that I said or did something which started or contributed to the argument, and that behind my words and actions there were certain character defects at work, perhaps impatience, or unkindness, or intolerance. My adversity, as is often the case with many of us, may have been self-inflicted. Having made such an examination, I move to take corrective action by practicing other applicable principles. Where I am in the wrong, I promptly and humbly admit it, and I sincerely make amends. Where my coworker is in the wrong, I forgive, turn the matter over, and let go of any ill feelings. By practicing these principles, I can surrender my resentment and obsession, reconcile with my coworker, and restore peace and harmony to our relationship. Not only do I recover from negative emotions myself, but I can help my coworker to do the same. My recovery goal is not self-centered. I’m not selfishly concerned only about my own well-being. Depending on the situation, I will find other principles that can help me to recover from adversity: after a loss, for instance, acceptance of the things I cannot change, and gratitude for the things I still do have. By practicing these principles day in and day out and in situation after situation, I am engaging in the kind of conscious, intentional, and repeated effort which Davidson says can help me to acquire the habits which can alter my brain and reshape my thoughts and emotions. I will become better at recovering from adversity, but my recovery will reflect fundamental character and emotional changes, not just an improved personality trait (more resilient). That personality and temperament are malleable, that emotion and cognition work in an integrated manner, and that experience and thought can reshape the brain are important ideas in Davidson’s book. When it comes to translating these ideas into practice, however, the 12 Steps remain the best program of action. Valuable read, if not a bit long winded in places. I appreciated the expansion on the emotional styles that make us unique and how the brain processes and interprets emotion. Much of the text is dedicated to the research and history of studying emotion and the brain, and also expounding upon the authors' experiences in researching this multidimensional topic. But I'll admit there were times the narrative lost my attention because it was so bogged down in the actual portrayal of these experiences Valuable read, if not a bit long winded in places. I appreciated the expansion on the emotional styles that make us unique and how the brain processes and interprets emotion. Much of the text is dedicated to the research and history of studying emotion and the brain, and also expounding upon the authors' experiences in researching this multidimensional topic. But I'll admit there were times the narrative lost my attention because it was so bogged down in the actual portrayal of these experiences and information. That's one of the reasons why it took me so long to pick this up, through a series of starts and stops. I thought it was very interesting and valuable, but even as an academically oriented text, I don't think there was a cohesiveness to the topic highlighted in each chapter versus what was portrayed. The questionaires on emotional patterns/dimension and diagrams highlighting the different parts of the brain were valuable, though, and I think people who want an introduction to how the brain functions with respect to emotions and its reactions will like this as a scientific read. For a self-help read, however, it's a bit weighted. If you've never read anything about the study of emotions/personality I am sure this books is a revelation. However, as someone who has read quite a bit about emotions, this book is just yet another author/researcher trotting out his "new" theory that looks pretty much like all the rest. Nothing new here. Another case of the emperor having no clothes. I highly recommend to anyone interested in how #mindfulness affects the brain. Excellent! unique & persuasive insights into the correlates of emotion in the brain. wish he commented on neurofeedback's effect (if at all) on changing these patterns. Great book about neuroplasticity with very interesing overviews on research. The main focus however is on getting to know your own brain and learning ways to chage how it works. Richard Davidson is an extraordinary neuroscientist. He has studied the brain for decades and focused his attention on development, not pathologes. At the same time he considers Dalai Lama to be one of his biggest influencers in life and nonetheless in work. My husband related a story recently about how he proposed studying the intersection of psychology and computers when he was an undergraduate student in the 1970's. Specifically, he was interested in how computers would impact people and their relationships. His professors uniformly said that this was not a serious idea - no one would be interested in this topic. It's easy to dismiss my husband's professors as myopic, but during the 70's and 80's cross-disciplinary studies were not common and not My husband related a story recently about how he proposed studying the intersection of psychology and computers when he was an undergraduate student in the 1970's. Specifically, he was interested in how computers would impact people and their relationships. His professors uniformly said that this was not a serious idea - no one would be interested in this topic. It's easy to dismiss my husband's professors as myopic, but during the 70's and 80's cross-disciplinary studies were not common and not routinely taken seriously. Richard Davidson, author of The Emotional Life of Your Brain: How Its Unique Patterns Affect the Way You Think, Feel, and Live -- and How You Can Change Them, had a similar experience when he proposed studying the connection between psychology and the brain. He was interested in learning about how different emotions manifest in the brain and how this information can be used by individuals and society. Davidson's decision to pursue his passion despite the lack of support and interest by the established academic community is what makes his story so interesting. Through his studies, Davidson came up with six distinct personality attributes. He suggests that the mind/body connection is so strong that doctors, both physical and mental, should understand their patients' personality profiles in order to treat them with maximum effectiveness. He also states that he doesn't believe in the idea "I'm okay, you're okay". Some personality attributes have a detrimental impact. When this is the case, he believes that people should work to change them. He outlines how this change can happen through meditation in the last chapter of the book. I first tried meditation in my teens and appreciate the power of the practice. Davidson also practiced meditation before it was trendy or socially acceptable. When he first proposed exploring the connection between meditation and the brain his professors told him to stay clear of the topic if he wanted to be taken seriously as a sciencist. He ignored their advice and pursued his own path. He began by studying more deeply and moved on to studying the brain patterns of deeply experienced meditators, new meditators, and those practiced regularly but who had not racked up thousands of hours of practice. His findings led to the recommendations in the last chapter of the book about specific meditation practices that people can use to improve their social awareness, attention, empathy, and outlook. He stated that psychology studies primarily focused on studying the negative - depression, anxiety, etc. He studied the positive - happiness, peace, etc. and thus opened a different way of conceiving the human experience and psychological treatment. I will say from the outset that this book was better than I thought it was going to be. That said, I didn’t have very high hopes to start. OK, that’s a bit unfair. "The Emotional Life of Your Brain" (TELoYB) is a decent read and does introduce some useful ideas I had not heard before. But, at the end of the day I didn’t feel all that smarter for reading it. TELoYB is one part professional autobiography, two parts popular psychology and one part self-help. The professional autobiography parts foll I will say from the outset that this book was better than I thought it was going to be. That said, I didn’t have very high hopes to start. OK, that’s a bit unfair. "The Emotional Life of Your Brain" (TELoYB) is a decent read and does introduce some useful ideas I had not heard before. But, at the end of the day I didn’t feel all that smarter for reading it. TELoYB is one part professional autobiography, two parts popular psychology and one part self-help. The professional autobiography parts follow coauthor Richard Davidson from his undergraduate days at NYU to his faculty position at the University of Wisconsin-Madison. In many ways, the biographical stories are the book’s best moments, especially if you’ve spent any time in academia. There is something universal about the anxieties felt by young graduate students and new professors regardless of subject area. The popular psychology comes from the exploration of the six emotional styles of resilience, outlook, social intuition, context, self-awareness and attention. The self-help bits come from the self tests you can take to assess yourself on these six emotional styles. Frankly, I found these self tests to be the least convincing bits of the book. It seems impossible to get a valid psychology result if you know that you’re being evaluated, especially when you the do the evaluating on yourself. Nonetheless, they are interesting categories and worth thinking about. ....then this is gonna be a great read for ya. Personally, it, ah, wasn't quite my thing. * "I showed some people who got botox a sentence that said "Beaches are pretty" and they didn't take as long to read it as when they saw the sentence "Sometimes people die" and that means negative emotions are controlled by the face." A unique look at the brain through the work of neuro-psycholgical researcher Richard Davidson, linking our emotions to significant circuits and activities in our brain. For those interested in the intricacies of the brain chemistry and circuitry this is the book for you. Davidson is a very good writer and explains complex scientific phenomena in laypersons' terms. Sometimes the detail has gotten a bit overwhelming to me and I skipped over that to the "so what does this mean" section. It has been A unique look at the brain through the work of neuro-psycholgical researcher Richard Davidson, linking our emotions to significant circuits and activities in our brain. For those interested in the intricacies of the brain chemistry and circuitry this is the book for you. Davidson is a very good writer and explains complex scientific phenomena in laypersons' terms. Sometimes the detail has gotten a bit overwhelming to me and I skipped over that to the "so what does this mean" section. It has been a good complement to my understanding of emotional intelligence, whose primary writer Daniel Goleman was one who encouraged Davidson early in his career when his ideas were not seen as plausible. The book also reveals how far neuroscience and psychology have come in the last 20 years. Very comprehensive and research-based book on how modern western psychology has learned a lot over the past decades about the human condition, specifically through the shift in studying the brain (neuroscience), embracing emotions as a core part of cognitive decision-making as well as health, and understanding the role of meditation in cultivating many mental and physical health benefits. Davidson bridges the gap between the scientific world that relies on research studies for knowledge retrieval Very comprehensive and research-based book on how modern western psychology has learned a lot over the past decades about the human condition, specifically through the shift in studying the brain (neuroscience), embracing emotions as a core part of cognitive decision-making as well as health, and understanding the role of meditation in cultivating many mental and physical health benefits. Davidson bridges the gap between the scientific world that relies on research studies for knowledge retrieval and the contemplative world that based much of its knowledge on direct experience and practice. مدهش هذا الكتاب! لا بسبب موضوعه الجميل فحسب، بل بسبب ما تحمله دراسات المؤلف من نتائج غريبة وجميلة أيضًا. ومدهش لأنه يطرح موضوع العاطفة من منظار مختلف تمامًا عن الشائع السائد في كتب علم النفس (على اختلاف تخصصاتها) والمشهور بين الناس. ولعلّ متعة مشاركة العالم رحلة علمه وتساؤلاته، واكتشافاته هي السرّ وراء مثل هذا . و قد أبدع الكاتب في سرده لفصول كتابه و أجزاء الفصول الداخلية بحيث بدا الكتاب مرتبًا سلسًا في التدرج وتعليم المعلومات الواردة. ولعلّ من الصعب أن يكتب كاتب أكاديمي بهذه السلاسة، التي تجعل ا مدهش هذا الكتاب! لا بسبب موضوعه الجميل فحسب، بل بسبب ما تحمله دراسات المؤلف من نتائج غريبة وجميلة أيضًا. و قد أبدع الكاتب في سرده لفصول كتابه و أجزاء الفصول الداخلية بحيث بدا الكتاب مرتبًا سلسًا في التدرج وتعليم المعلومات الواردة. ولعلّ من الصعب أن يكتب كاتب أكاديمي بهذه السلاسة، التي تجعل الفصل يُسلمك للذي يليه وكأنه لم ينقطع. ولعلّ الاسلوب القصصي والسردي لقصة المؤلف نفسه ساعد في ذلك. أعيب على الكتاب اسرافه في التفصيل في ذكر رحلته إلى التبت ودراسته للتأمل. فقد اسهب الكاتب أكثر من اللازم. أيضًا أجد تكلّفًا في ما ذكره من طرق تغيير النظام العاطفي، ولعلّ علاقة الكاتب بطقوس التأمّل هي السبب وراء هذا التكلّف. Excellent book. After finishing Quiet: the Power of Introverts in a World That Can't Stop Talking, by Susan Cain, I read The Power of Habit: Why We Do What We Do in Life and Business, by Charles Duhigg. The Emotional Life of Your Brain was a great follow up. They all help with understanding how the brain works -- and more important, how you can actually change it with practice by meditation and other techniques. Now on to a few others: two by Daniel Goleman (author of Emotional Intelligence): Wo Excellent book. After finishing Quiet: the Power of Introverts in a World That Can't Stop Talking, by Susan Cain, I read The Power of Habit: Why We Do What We Do in Life and Business, by Charles Duhigg. 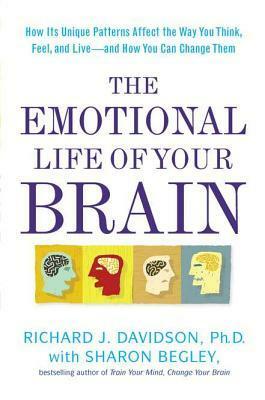 The Emotional Life of Your Brain was a great follow up. They all help with understanding how the brain works -- and more important, how you can actually change it with practice by meditation and other techniques. Now on to a few others: two by Daniel Goleman (author of Emotional Intelligence): Working with Emotional Intelligence; and Social Intelligence: The New Science of Human Relationships. And one by Jon Kabat-Zinn -- Wherever you Go, There You Are: Mindfulness Meditation in Everyday Life (which helps put some of Davidson's information about changing the brain into practice). This book offers an interesting framework for assessing and adjusting your Emotional Style along 6 key dimensions: Outlook, Resilience, Social Intuition, Self-Awareness, Sensitivity to Context, and Attention. Apparently backed by science, and potentially useful. However, for a self-help book, it's unnecessarily long, dense, and meandering. It reads like an under-edited cross between a "history of brain science" textbook and a "how I became a famous brain scientist who studies meditation" memoir. This book offers an interesting framework for assessing and adjusting your Emotional Style along 6 key dimensions: Outlook, Resilience, Social Intuition, Self-Awareness, Sensitivity to Context, and Attention. Apparently backed by science, and potentially useful. However, for a self-help book, it's unnecessarily long, dense, and meandering. It reads like an under-edited cross between a "history of brain science" textbook and a "how I became a famous brain scientist who studies meditation" memoir. Nothing wrong with either of those, but neither is anything close to what's promised by the title, cover, and promotional blurbs. Made me want to re-read The Spiritual Brain: A Neuroscientist's Case for the Existence of the Soul by Mario Beauregard. It is amazing to me that emotions were so disregarded in academic circles as described in the beginning of the book. As many of the "secular" meditation methods are based on Buddist practice, I kept trying to apply it to LDS beliefs. D&C 8:2 says "I will tell you in your mind and in your heart, by the Holy Ghost". I believe "mindfullness" meditation - where one non-judgementa Made me want to re-read The Spiritual Brain: A Neuroscientist's Case for the Existence of the Soul by Mario Beauregard. As many of the "secular" meditation methods are based on Buddist practice, I kept trying to apply it to LDS beliefs. D&C 8:2 says "I will tell you in your mind and in your heart, by the Holy Ghost". I believe "mindfullness" meditation - where one non-judgementally observes one's physical sensations, as well as emotions and thoughts - is comparable to listening for the Holy Ghost to answer prayers. This book is a mix of science, psychology, personal history, and pracitical guidebook. Davidson explains his own journey to and through studying emotions as brain based. He also illuminates how his findings can and should affect others. The book engages the reader with assessments, clearly labeled diagrams, and personal anecdotes, yet it also delves into some history and plenty of research. I'd recommend it for anybody interested in the intersection of mindfulness, emotions, and science. So how does neuroplasticity work in practice ? Well, for example, scientific research and experimentation conducted by Davidson demonstrates that a more Positive Outlook Style is caused by a stronger physical link between the Pre-Frontal Cortex and the ventrial Striatum. So to give yourself a more positive Outlook if indeed that is what you want (Remember: pessimism can be good as well, as it may make you a better manager of your personal risk), you need to do exercises which strengthen that link. The authors suggest repeatedly putting yourself in situations which require forethought and planning. Slightly counter-intuitively, this means you actually repeatedly place yourself in front of temptations for instant gratification (e.g. junk food, shopping for luxury goods), and practice refusing, because you convince yourself this would be better for you in the long term.